I have to admit that even though I’m a fan of spicy food I’m not really into Buffalo sauce or Buffalo wings. I mean, I’ll eat it but it’s not the kind of food that makes me want to do a backflip after having the first bite. I just think it’s OK, not out of this world fantastic like most people. I know, what’s wrong with me? Right? But, it is, what it is. I always have my wings smothered in some other kind of sauce like teriyaki, spicy mango, or anything Asian. So what made me try today’s recipe? The ranch dressing, period. Ranch dressing goes with anything, salads, veggies, wings (yep, I dip mine in ranch and not blue cheese, how’s that for being a rebel?) and even pizza. On top of that, it’s a slow cooker recipe, you dump everythinng in, turn it on and a few hours later you’ll have some of the best wraps you’ll ever have. The original recipe called for half an envelope of the ranch dressing mix but of course I had to tweak that to my liking. It also says to serve it on buns, which by the way, it’s absolutely delicious but again, I had to change that as well and use tortillas instead. And, I have also thought of putting it in arepas just to see what they would taste like. No need to wonder, I’m sure they would be the most amazing arepas… with a kick. So you see, it’s an easy recipe that doesn’t take a lot of time to make and everybody will love. Oh, and if you don’t have a slow cooker, just boil the chicken in water, shred it and then mix it with the rest of the sauce ingredients. Yes, it’s that simple. Place the buffalo sauce, water, ranch dressing mix and chicken in a slow cooker. Cover and cook at low temperature for 5 hours. 2. When the chicken is done, shred it with two forks and then add the butter. 3. 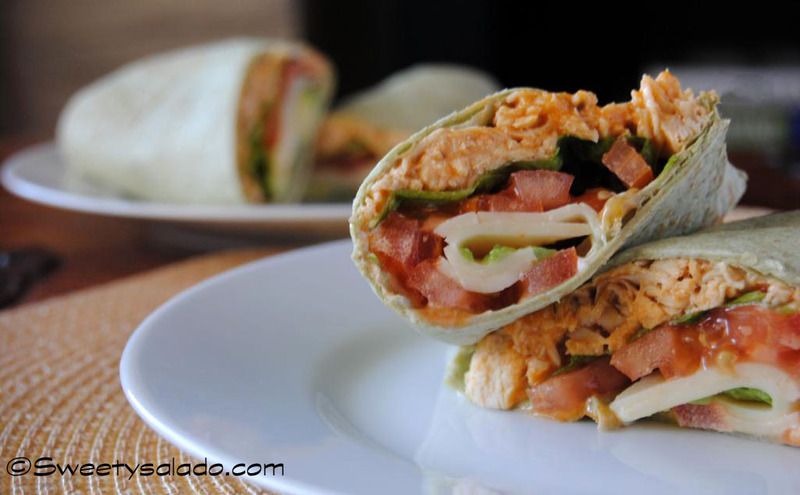 To make the wraps, spread the mayonnaise over the tortillas, then add the chicken, lettuce, tomato, cheese and avocado. Fold the end of the wrap, then both sides and roll up. 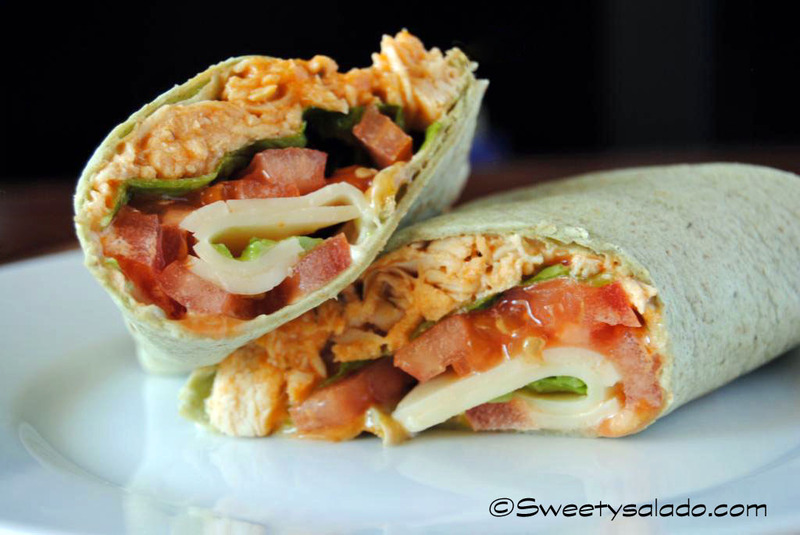 Cut each wrap in half before serving.